I have used this model for over a year now and it has never broken, leaked, flooded, or prematurely stopped. It does not do the best job of washing clothes, but it does remove the basic stains and discolorations using regular “Tide” detergent. I have no ideas as to the energy consumption, but I do not really care. It is average in nearly every way imaginable – loading ease, noise, cycle length, quality, price, load capacity for similar footprint machine, appearance, durability, and everything else. I would recommend anyone to buy this model if it is the best you can do for a small budget, but if you are looking for a better than average machine and willing to pay for it, buy something better than this unit. I have only overloaded it once, and the cleanliness of the load was noticeably less than a smaller load. I encourage anyone considering this unit to trust that while it will do its job, but that if you buy expensive clothes, to consider purchasing a model that will better protect your investment. This unit has conventionally outdated technology, with no steam cleaning or similarly modern features. A college student or working couple or family should be fine with this unit though, just not business men and women. This model has an EXTRA CAPACITY 4.6 ft as to regular 3.4 which is GREAT!! I regularly wash large comforters in this and the machine does an EXCELLENT JOB!! As to the other review, I think the guys cleaning comment is related to his choice of detergent. Liquid detergents work best put in after the tank fills. Has GREAT agitation!! Love it! The size of the washing machine is such a wonderful feature. It doesn't look very big when you are just staring at it, but it actually will hold a very large amount of clothes. It seems as though 2 loads of laundry can fit into this washer and fit just right. 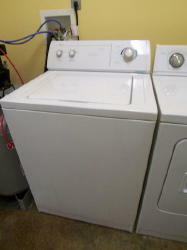 The inside size of the washer does not affect how big the outside of the appliance is. It fits into a small corner of my washer room where I can still get around and not have a bulky washer in my way. Even when I have packed the washing machine to the fullest I still have my clothes come out VERY clean. I have owned several washing machines in my life and this one is by far the best. It's design is more focused on making sure that the quality of your wash is met before the silence aspect of it. I have 7 children and I do a lot of laundry and my children get everything under the sun on their clothes and I have always been able to get the stains out of their clothes without using heavy duty detergents or washing the clothing items more than once. I get them in the washing machine and don't have to worry about checking on my clothes because I already know that they are going to come out clean and stain free. The rinsing cycle on this washing machine is top quality. I never have clothes that have that left over detergent stuck to them. Our skins never get irritated from the detergents that I use because the washing machine will rinse the clothes so well that they have no dirt, stains or left over detergent. After using the washing machine for the last year I have never had a single item of clothing get destroyed or start to get that used look to it. The washing machine is thorough but not rough on your clothes. You will notice that your clothes will have the same thickness and tightness that they always did because how the clothing items is handled is so gentle yet effective. I would without a doubt recommend this washing machine to anyone. I am absolutely and completely satisfied with this washing machine. I got this Whirlpool washer approximately 1 year ago, I am renting it, but plan to purchase one as soon as I can afford it. Its a very reliable machine, it cleans well, goes through the cycles properly, and my clothes always come out clean and fresh. I also like the way it goes through cycles and does not make alot of noise like some other machines I have heard running. It holds alot of clothes too, I don't overload it of course, but it is a large machine and I can do big loads and feel comfortable that they all will be clean when I am done. I have always had a Whirlpool in the house my whole life and they have all been good, I will stick with this brand. I would recommend the Whirlpool washers to anyone who wants to feel comfortable in knowing their clothes will be clean and fresh after being washed.